‘Poverty is no accident’: protesters march peacefully against the proposal to add a ban on rough sleeping to the Street Use and Public Places bylaw. Photos: Ryan Wood. 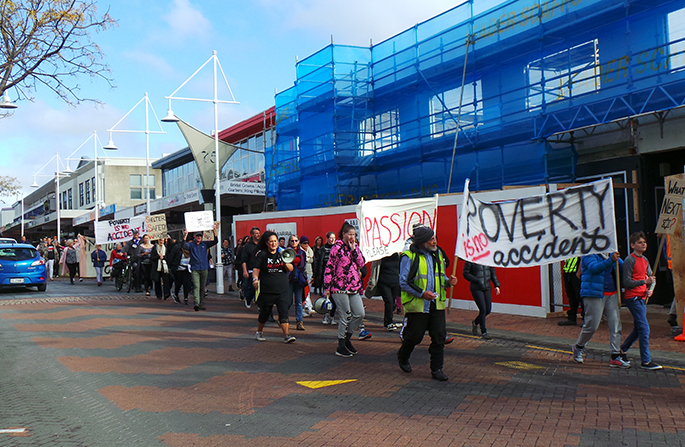 Around 50 people marched down Devonport Road and around the CBD this afternoon to protest a proposed bylaw that would ban rough sleeping in the city. Councillors voted 6-2 in favour of the bylaw amendment at a Community and Culture committee meeting last week, despite advice from the council’s legal staff saying the bylaw would be unenforceable. 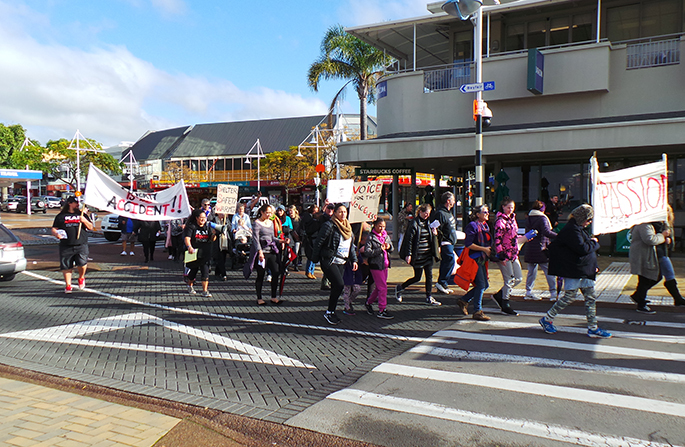 The hikoi, organised by Kai Aroha and Street Kai, was a peaceful affair, beginning at the corner of Third Avenue and Devonport Road at around 1.30pm, before continuing down the latter thoroughfare at a leisurely pace. 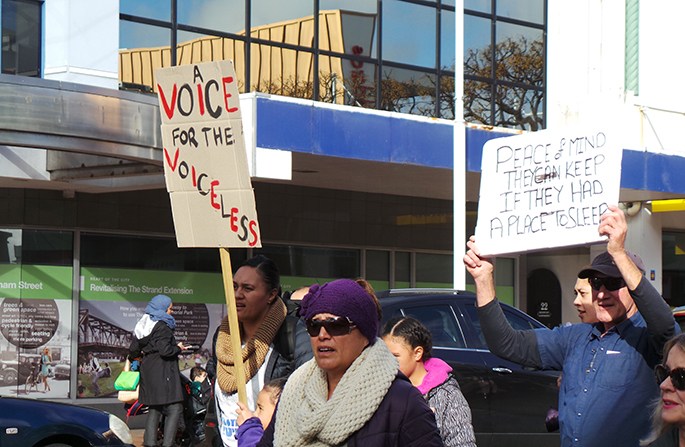 Marchers chanted ‘Peace of mind they can keep if they have a place to sleep’; ‘No bed to lay their head, on the street is where they sleep’; and ‘Kotahitanga one for all and all for one’. 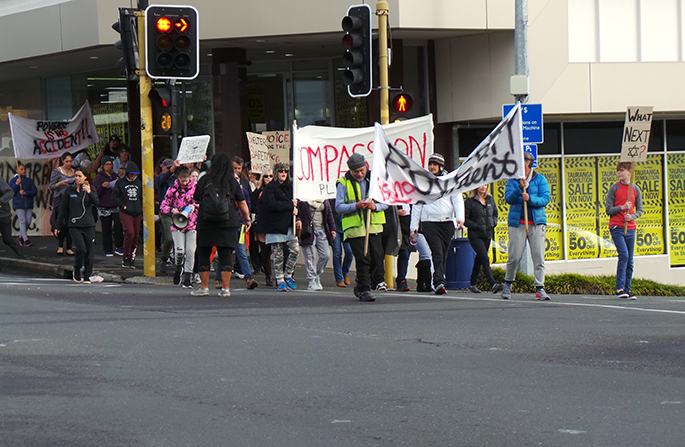 Traffic was only slightly impeded during the march, which kept to the left and generally on the footpath. Marcia Taikato-Whauwhau, of Kai Aroha, says her group provides meals and kai packs for those in need to take home, and are based at the Greerton Hall in winter. 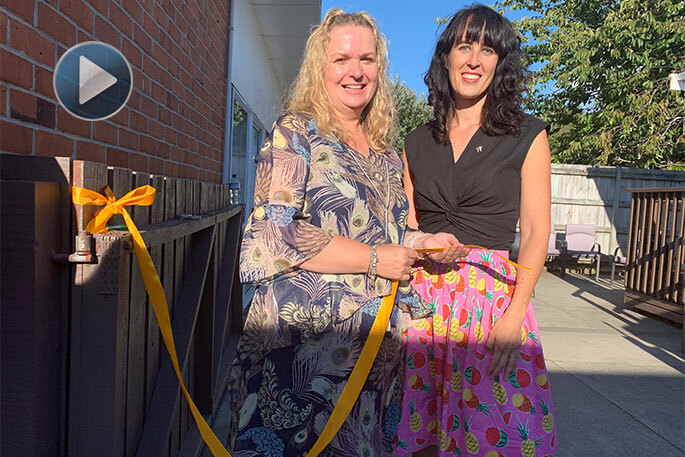 She says they’re not against the banning of begging, but the ban on sleeping within five metres of a retail premises will put ‘streeties’ in danger. She says drunk people coming to the CBD on a Thursday, Friday, and Saturday night can sometimes cause problems for rough sleepers, getting into altercations with them. Tracey Carlton, of Street Kai, says her group provides meals twice a week at the Willow Street bus stop. She agrees with Marcia, saying ‘practical solutions’ are needed. “There’s a growing number of women living on the street, and it’s of great concern for us,” she says. However, it would appear the proposed amendments to the Street Use and Public Places bylaw would make no difference to the situation. 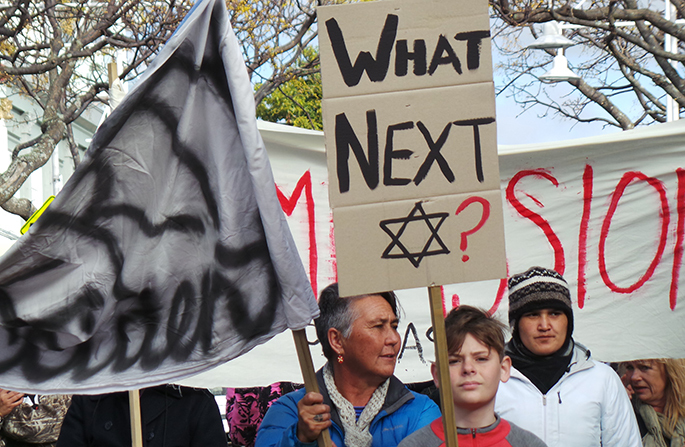 Tauranga City Council staff, reporting back to members of the Community and Culture committee in May, pointed out that similar amendments to bylaws had been made by councils around New Zealand, but had proved unenforceable. 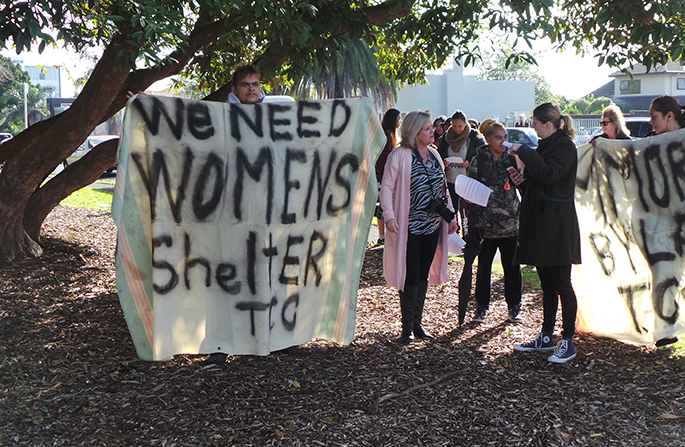 TCC community services general manager Philip King says if the amendments become law, it would be up to the council’s bylaws officers to enforce the begging and rough sleeping ban. “Police are not able to enforce this particular bylaw. He says there is no ability to charge infringement fees for begging or rough sleeping. “In the first instance, our bylaws officers would look to connect someone begging or rough sleeping with the appropriate agencies, which is what they already do without the bylaw. - A behaviour change programme, ‘Your Help May Harm’ being introduced across the city to educate the community about the adverse harm of giving to beggars, and the importance of connecting these people with the services and support they need in the short and longer term. ‘Your Help May Harm’ cards have been printed and distributed to Greerton, Mount Maunganui, and city centre Mainstreet managers and retailers. Internationally, education programmes are considered one of the most effective methods of dissuading begging, particularly from those who are not in genuine need. 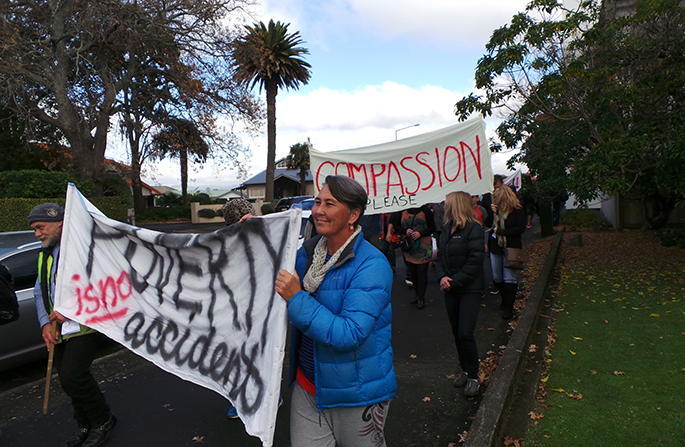 - A City Safety Plan was adopted in March 2018 with a variety of initiatives to improve safety and reduce anti-social behaviour across Tauranga. - Bylaws officers engage daily with those begging and connect them to social services agencies where possible. - Establishment of a 0800 number for people to phone directly if they are concerned about anyone they see on the streets. - Two security guards patrolling Greerton shops Monday to Saturday. 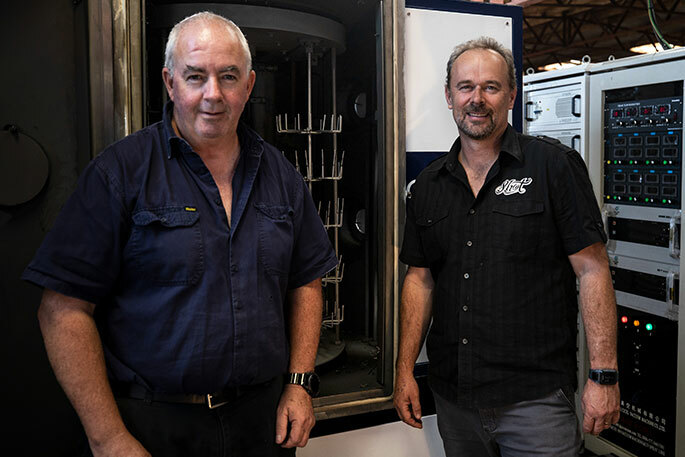 - Additional CCTV cameras installed in Greerton and across Tauranga. - An additional staff resource is budgeted in the Long Term Plan and the 2018-19 budget for a City Safety Ambassador who will engage with those begging and/or rough sleeping to connect them with appropriate support services. - The draft Community Wellbeing Strategic Plan contains objectives and initiatives to reduce homelessness. 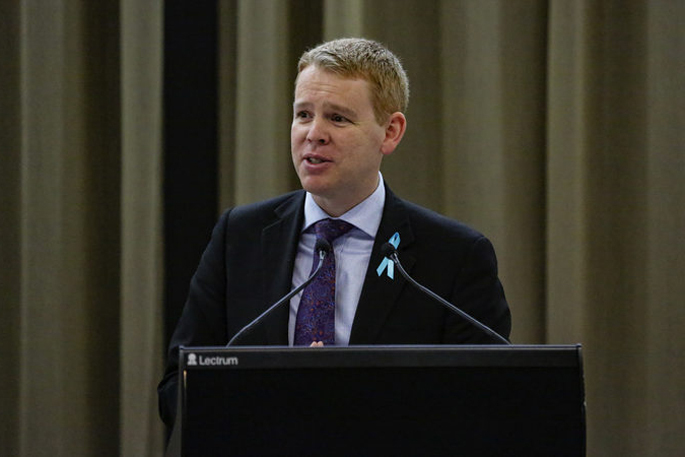 - The Housing First Initiative to address homelessness opened its doors in Tauranga in June its year. Housing First prioritises finding people safe, secure and permanent housing first, and then wrapping around the services needed to help people sustain their tenancies, support their health and wellbeing and return to independent living and participating in community life. 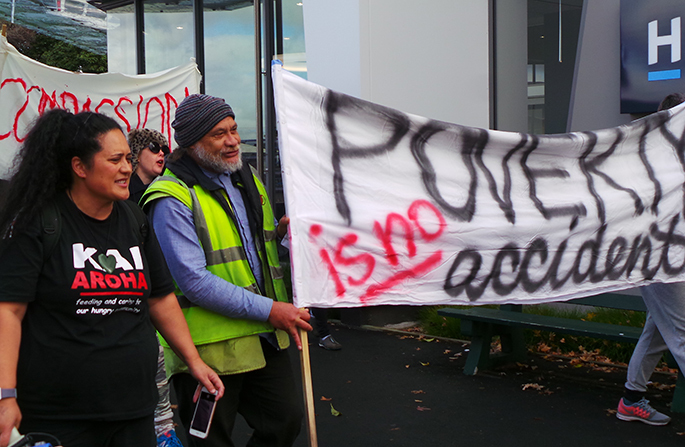 If every member of the Hikoi, took one of homeless home with them it would help. There actions would seem more genuine. Poverty is no accident. Bang on. It’s overwhelmingly due to bad decisions, despite being given every opportunity. At what point do people take responsibility? hikoi [whatever that means] all you want. just get rid of all the beggars and layabouts. Who has so much free time as to march? Those sleeping rough can bugger off. It’s gross walking the CBD with these ferals lying around. Unpleasant for everyone else.